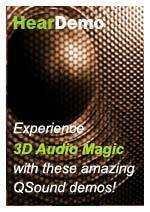 Check out these interesting QSound multimedia software products. Using QSound's QCreator software, we transformed some regular mono audio files to create a more life-like 3D stereo sound field. Listen to this walkthrough of QCreator -- the sounds are so real that, if you close your eyes, you'll feel like you can reach out and touch them! We put together a short corporate profile on QSound, using our new AudioPix 2.0 software. AudioPix 2.0 lets you create dynamic photo albums or digital scrapbooks, combining your favorite music tracks with your digital pictures. Easy to use multi-media software! Copyright © 2013 QSound Labs, Inc.